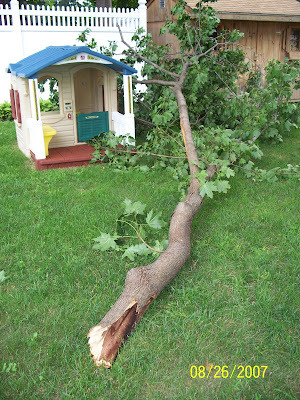 A Tree Nearly Smashed our House!!! Last night when I headed to bed I actually commented to Nick that it was really windy and looked like the trees could fall down. Well... we woke up this morning... and there it was. A tree almost crushed our house!!! OK... maybe that was an exaggeration. It was just a branch. And it's probably not the house you figured I was talking about. Still... how devastated would we be if that huge branch fell a few a little to the left? Some hearts would be broken! Luckily the house made it through in one piece... and we suddenly found ourselves with a very busy and interesting Sunday morning. Zoe and I were still in our pj's when we had our arbor adventure. I took too many pictures (nothing new there) so I figured I'd put them together so you could really see what was happening. 1. You'll notice that when I grabbed my camera Zoe figured she needed one too (we really need to find her some kind of toddler camera). 2. You'll hear Zoe blames a beaver for our tree falling. I've mentioned Peep before. In one episode there is a beaver who has just become old enough to learn how to be a "tree feller" so his parents are trying to teach him the proper way to make the trees fall. Seems like maybe we've seen that episode of Peep one too many times? Anyway, Zoe is convinced we have beavers now. 3. By the "end" Zoe was tired of the tree, so she decided it was a horse.